A bullet shot out of a high-powered rifle can travel at speeds up to 2500 miles per hour. In one second it would travel one kilometer in distance. Whatever it strikes would be pulverized on impact. Now imagine a boulder-sized asteroid arriving from outer space, and hitting the earth at twenty times this speed (roughly 20 kilometers per second). The impact energy released would be comparable to an atomic bomb exploding. Now imagine an asteroid that is one kilometer in diameter, weighing roughly 1.4 billion tonnes, hitting the earth at this speed. The force of impact would be so great that it would mostly vaporize the asteroid. And the impact energy released would be so tremendously powerful that it would be much greater than all the energy released if all the atomic bombs in the world went off at once. It would truly be like Armageddon. You can easily estimate the impact energy of an asteroid. You do this by calculating the kinetic energy of the asteroid just before it strikes the earth. This is equal to the impact energy. For example, consider an asteroid that is one kilometer in diameter and weighs 1.4 billion tonnes (M = 1.4×1012 kilograms), and is traveling at 20 kilometers per second (V = 20,000 m/s). The kinetic energy would be equal to (1/2)×1.4×1012×(20,000)2 = 2.8×1020 Joules. It is hard to imagine such immense energy. But over the course of geologic time, the planet earth has been struck many times by numerous asteroids, some very large. 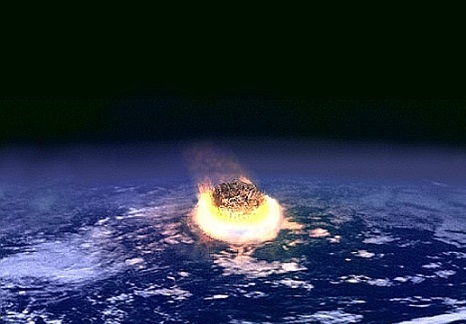 In fact, it is believed that the extinction of the dinosaurs was likely caused by a massive asteroid (or comet) impact and its catastrophic effects on the global environment. 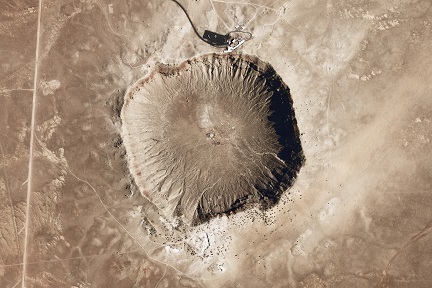 A popular tourist attraction is the Barringer Crater in the Arizona desert. It is about 1200 meters in diameter and 170 meters deep. The crater is shown below. This crater was created by an asteroid impact about 50,000 years ago. It is estimated that the asteroid was about 50 meters across. Many asteroids explode in the air before they ever reach the ground. As they travel through the air at a velocity of 15-20 kilometers per second, they experience huge pressure forces due to the enormous air resistance felt at this high speed. These pressure forces cause the asteroid to explode violently. When asteroids explode in the air in this manner, they are called airbursts. The explosion energy of an airburst is comparable to the energy released by a ground strike. If a large asteroid, one kilometer in diameter, impacts a large body of water, such as an ocean, the consequences can be just as disastrous as a ground strike. The impact would create waves hundreds of feet high which can flood and devastate coastal communities all around the world. There are scientists currently monitoring outer space for asteroids that threaten to impact the earth. Fortunately, the vast majority do not. But occasionally, some do. On February 15, 2013, an asteroid 20 meters in size entered the earth's atmosphere over Russia, at a speed of about 20 kilometers per second. It exploded about 30 kilometers above the earth in a massive airburst explosion estimated to be about 20-30 times more powerful than that of the atomic bomb dropped on Hiroshima. It created a very bright flash, brighter than the sun, and generated a powerful shock wave that blew out many windows. 1500 people were injured. The asteroid was estimated to weigh over 10,000 tonnes. Here is a video of the asteroid as it explodes. This is the largest known natural object to have entered earth's atmosphere since the 1908 Tunguska event which flattened 2000 square kilometers of remote forest in Siberia. Its blast energy was about 1000 times greater than that of the atomic bomb dropped on Hiroshima. Early warning of an asteroid impact is crucial to saving as many lives as possible. It is currently far too easy for a planet-killing asteroid to be undetected until it's too late. Attempts are currently being made to ramp up the monitoring efforts for improved early warning, since this will save as many lives as possible. In 2008, a successful early detection was made. The asteroid, called 2008 TC3, was 4.1 meters in diameter and weighed 80 tonnes. It entered earth's atmosphere on October 7, 2008 and exploded as an airburst at an altitude of about 37 kilometers above the Nubian Desert in Sudan. More ambitious plans involve preventing deadly asteroids, which are on a collision course with earth, from hitting the earth. This would involve deflecting the path of the asteroid somehow, perhaps by sending out a rocket to collide with it, and knock it off course. Other more elaborate strategies are possible, such as using focused solar energy to vaporize material from the asteroid surface, creating a small thrust, which, over the course of months and years, can deflect the asteroid trajectory sufficiently to prevent it from colliding with earth. This however, requires that knowledge of its impending collision be known well ahead of time.